Forget the hustle and bustle of overwhelming Marrakesh... there's a new kid on the Moroccan block. If you're looking for laidback vibes, blissful paradise and world class surf, Taghazout should be the only name on your lips. 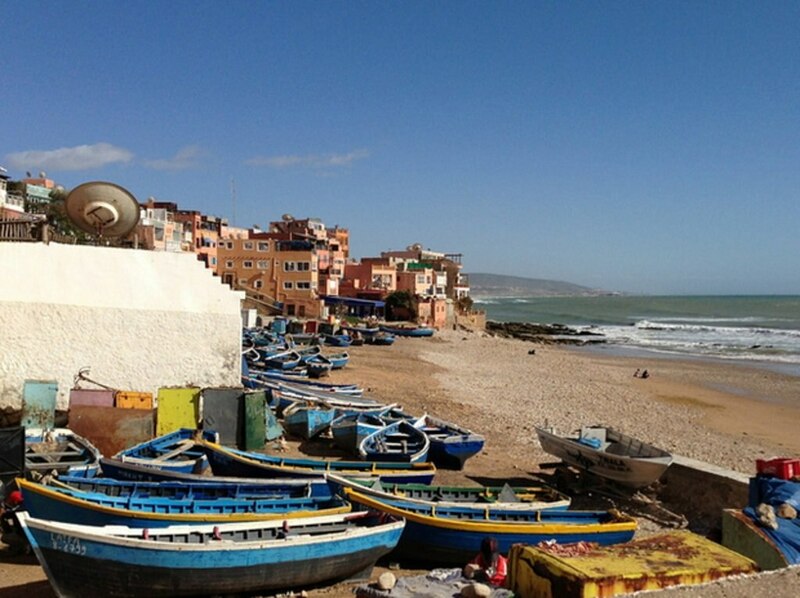 Once a simple fishing village, this little gem on Morocco's Atlantic coast is sure to be your new favourite nirvana. Here's why. If there's one thing that Taghazout is known for, it's surfing. And when we say 'known', we mean world renowned, with an intrinsic love for the sport running in the very veins of the town. The other speciality that burns with a fiery popularity in Taghazout is yoga. Whether this is because the practice helps with surf technique or whether it's because yoga simply fits so well with the hedonistically tranquil lifestyle of Taghazout is anyone's guess, but one thing's for sure: from sunrise to sunset, you'll find yogis practicing their downward dog to the soundtrack of gently lapping waves along the seashore. Of course, one of the many draws of Morocco is its cuisine - and Taghazout is no exception. Where better to enjoy a classic Moroccan tagine than overlooking the warm sands as the sun goes down? If you happen across a day in Taghazout when the surf is flat, never fear. Just a few miles north is Paradise Valley, an off-the-beaten-track utopia more than worthy of a day trip. 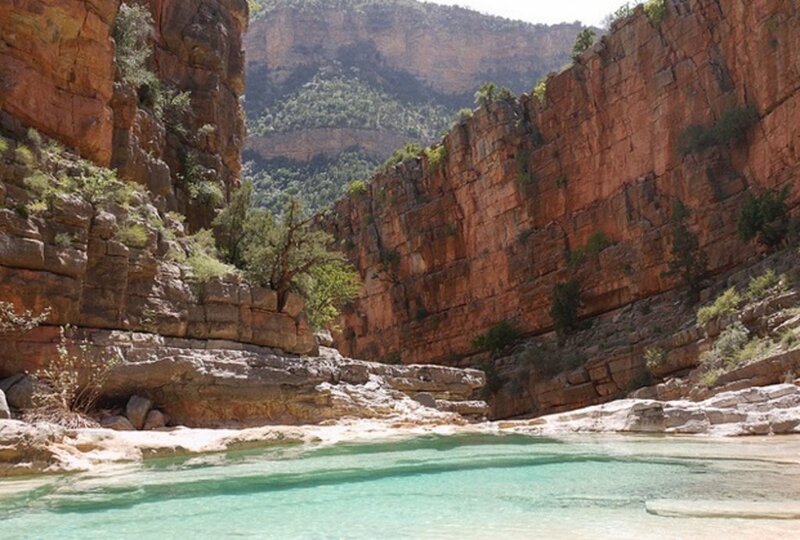 A deep gorge lined with palm trees with a river snaking along the bottom, Paradise Valley is a little slice of lusciousness hidden beneath the Moroccan dust. There's not much more to it than that. But hey, that's the point. And life doesn't get much more chilled out than in Taghazout. Getting there: Taghazout is a 40 minutes bus ride from the nearest airport in Agadir or 3 hours from Marrakesh. Nestled on the beach, this Agadir resort is within a 10-minute walk of Casino Le Mirage and Agadir Beach. Vallee de Oiseaux and Agadir Open Air Theatre are also within 1 mi (2 km). Nestled on the beach, this Agadir resort is within a 15-minute walk of Casino Le Mirage and Agadir Beach. Stade Al Inbiaate and Royal Palace are also within 1 mi (2 km). 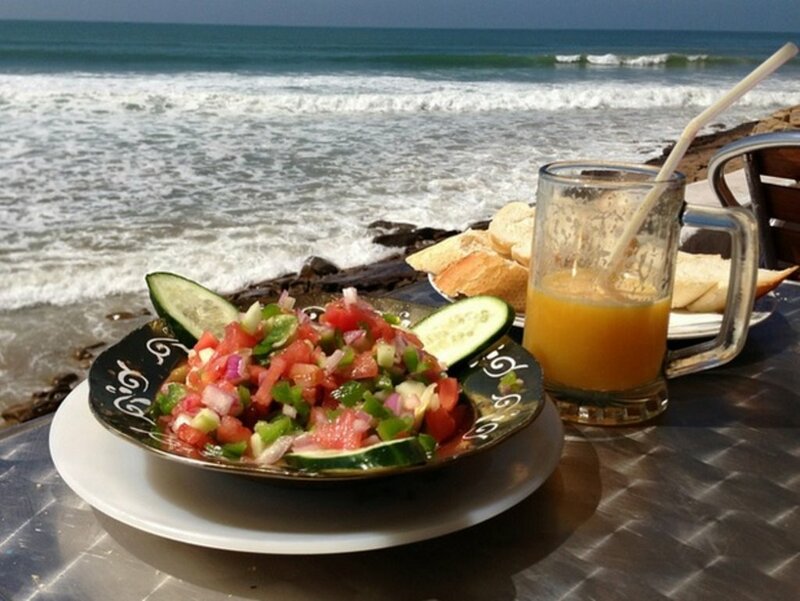 It is right on the edge of the huge Agadir beach, with beautiful fine sand and only 1 km from the city centre. This hotel offers a varied entertainment programme and a wide range of sporting activities. Spacious lobby with reception and seating areas, lift, main restaurant, À la carte restaurant, bar, hairdresser¿s, beauty salon, and several shops. The pool landscape and a pool bar are located in the extensive grounds. Sun loungers and parasols are available here at no extra cost (extra charge on the beach). Deposit payable for towels. All the rooms are fully fitted with telephone, safety deposit box, satellite TV, minibar, hairdryer, bath, shower, WC, air conditioning and balcony or terrace. A modern Moorish-style hotel situated in the tourist centre of Agadir, 500 metres from a six kilometre-long sandy beach. The air-conditioned rooms are decorated in colourful style, with brightly painted dressing tables and furnished balconies. Guests are pampered at the hotel’s health spa, hot tub and hammam, and can cool off afterwards in the large outdoor pool. Located in the heart of Agadir, this spa hotel is within a 10-minute walk of Shems Casino, Vallee de Oiseaux, and Agadir Open Air Theatre. Stade Al Inbiaate and Musee du Patrimoine Amazigh are also within 10 minutes. This beachfront property is located in Agadir an area washed by the waters of a large bay and also known as a modern tourist centre throbbing with vitality. Nestled on the beach, this Agadir hotel is within 2 mi (3 km) of Casino Le Mirage, Royal Palace, and Stade Al Inbiaate. Golf Club Med les Dunes is 3.5 mi (5.7 km) away. Informal self-catering apartment complex featuring Moorish architecture, located 800 metres from Agadir Beach. Simple, kasbah-style apartments have Moorish arches; all come with kitchenettes and separate living rooms. Moroccan bar lounge serves a range of cocktails and overlooks the spacious sun terraces surrounding the pool area. Situated near the beach, this spa hotel is within 2 mi (3 km) of Casino Le Mirage, Agadir Beach, and Royal Palace. Stade Al Inbiaate and Agadir Open Air Theatre are also within 2 mi (3 km). Modern property situated on the edge of a sandy beach, located three kilometres from the centre of Agadir. Air-conditioned guestrooms are decorated in cream with red and white fabrics, all with balconies and cable TV. Hotel houses an onsite spa centre; guest can also make use of the three swimming pools, cigar bar and café..
Large high-end hotel built in typical North African Kasbah-style architecture, located on the beachfront of Agadir. The 273 air-conditioned guestrooms are decorated with local motifs and dark wood furnishings; all have cable TV and minibars. Guests can dine in two restaurants, swim in the huge swimming pool, and head down to private beach for watersports. Contemporary Moroccan-style resort with grounds leading to a private beach, less than one kilometre from the city centre. Guestrooms have warm pastel decor and come with balconies; all have climate control, minibars and satellite television. Guests can pamper themselves in the spa, then stroll down to the beach to ride the waves or just soak up the sun. Whitewashed buildings with Moorish detailing, set 300 metres from Agadir’s nine kilometre-long sandy beach. Rooms are decorated in light tones and have small patio areas, bathrooms with handheld showers and telephones. The hotel organises live music and entertainment programmes; children are catered for with a supervised kids’ club. Traditional colonial-style Moroccan hotel, sited 750 metres from the city centre and 300 metres from a long, sandy beach. Guestrooms have light decor with sliding glass doors onto balconies; all have air conditioning and satellite television. Guests can enjoy a drink by the pool on the garden terrace and dance the night away in the hotel's own nightclub. Situated near the boardwalk, this luxury hotel is within a 15-minute walk of Casino Le Mirage and Agadir Beach. Musee du Patrimoine Amazigh and Stade Al Inbiaate are also within 1 mi (2 km). This family-friendly Agadir resort is located on the boardwalk, within a 5-minute walk of Shems Casino and Vallee de Oiseaux. 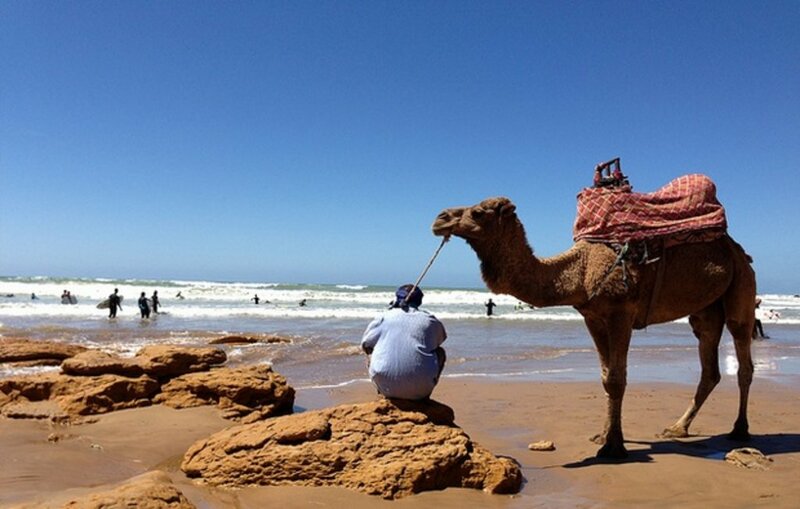 Agadir Beach and Jardin de Olhao are also within 15 minutes.